Will online forums help foster an informed citizenry, ready to participate in the democratic process? The world’s experts in deliberative democracy and human-computer interaction came together this past spring at Stanford University (CA) to discuss how technology can change the way people interact and, ultimately, make collective decisions. In an opening plenary panel session, Carnegie Mellon University (PA) ethicist and philosophy professor Robert Cavalier described PICOLA, a Public Informed Citizens Online Assembly that uses software developed at CMU. His project’s goal is to create a high-telepresence environment for online deliberation into which the user is easily immersed in the virtual world. Special guest lecturer Douglas Engelbart (best known as the inventor of the computer mouse) elaborated on his talk, “Bootstrapping: Accelerating the Evolution of Collective IQ,” during an informal evening discussion group. “Humans’ capabilities depend upon their augmentation system,” explained the humancomputer interaction pioneer. 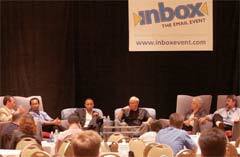 Industry groups are working hard to make e-mail technology straightforward for campus users. At this summer’s INBOX in San Jose, industry leaders met to discuss anti-phishing, compliance, best practices, mobile apps, and more. Sessions like this Executive Roundtable included top leadership from companies like CipherTrust (www.ciphertrust.com), Cloudmark , Iron- Port , MailFrontier , and Sendmail . 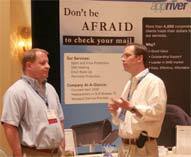 Companies dealing with spam filtering and other e-mail administration issues lined the aisles of the INBOX exhibit floor. Most of the companies serve higher education as well as corporate customers—especially service providers like AppRiver (www.appriver.com), whose reps told Campus Technology that they feel their higher ed customers are responding well to their hosted antispam service model.